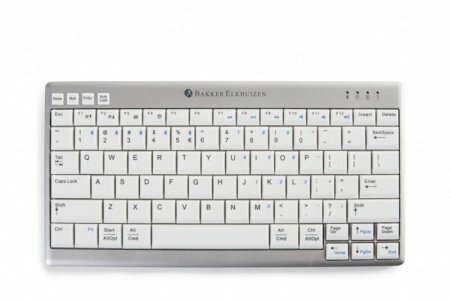 The UltraBoard 940 Compact Keyboard from BakkerElkhuizen is a unique ergonomic keyboard that can be used wirelessly or via USB cable. Pair up to 5 wireless Bluetooth devices and switch between them at the touch of a button. Both wired and wireless connectivity The UltraBoard 940 connects via USB cable bluetooth. Plug in with the cable when the keyboard needs to charge. This allows you to easily switch via a keyboard shortcut between your PC, tablet, smartphone and other devices. 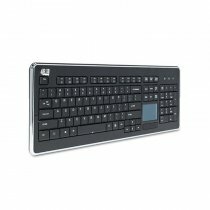 Typing sensation The UltraBoard boasts a light, responsive keystroke due to its scissor mechanism key design. This provides exceptional tactile feedback. Mac and Windows OS compatible The UltraBoard 940 supports both Mac and Windows operating systems. Switch between Windows and Mac devices via a simple keyboard shortcut. Light key colour Dark letters on a light background facilitate reading and support higher productivity. Ultra thin The UltraBoard is a very comfortable, compact keyboard, not only due to its compact shape but also its thickness of only 0.75 inches.